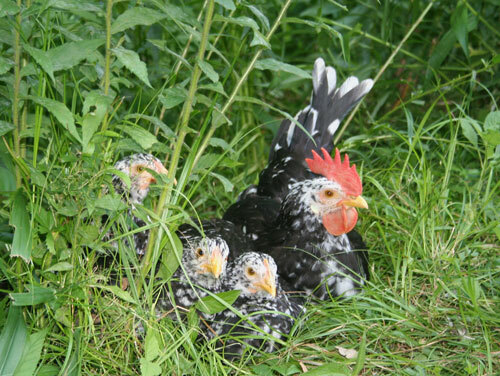 Ancona chickens are beautiful birds, best known for their speckled feathers and proud comb. First bred in the 1850's in the Italian city of Ancona, but later bred mainly in the United Kingdom and eventually in the United States. Ironically they are not very popular in Italy and attempts to bring them back to Italy have been going on since the early 2000’s. They are well known as foragers, good egg producers, and as show birds. The Ancona’s color is a deep green or beetle green with white speckles at the tip of each feather. They have a medium sized comb and can have a rose comb or single comb.Until recently they could only have a large single comb in shows, but now rose comb varieties are acceptable. Anconas are one of the more visual appealing breeds and seems to share physical traits with the Leghorn, however they are a distinct breed. Anconas are a hardy breed especially in the winter, but their combs are susceptible to frostbite. They are natural foragers making them economically easy to feed. Anconas are commonly described as “flighty but friendly” sudden movements can startle them. But they are generally easy to handle. Anconas are ideal for laying eggs as they lay eggs really early into their life cycle. Anconas can lay around 200 to 270 eggs a year and the eggs themselves are large and white.